Not an instant classic but definitely full of thrills! Twenty-three years after Arnold Schwarzenegger and a tag team of expendable commandos made a stand in the Guatemalan jungle against the fierce alien in Predator, the franchise returns to its tropical roots. 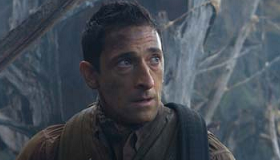 Only this time the jungle is an alien planet, the hunted are criminals not commandos and Oscar winner Adrien Brody leads a far sleeker cast. Produced by Robert Rodriguez, who wrote an early and uncredited version of the screenplay, and helmed by Vacancy director Nimród Antal, Predators is sometimes silly and hardly original, but it delivers the thrills. Released as counterprogramming to the kid-friendly Despicable Me, it ought to score solid if not spectacular numbers, finding a readymade audience among Sci-fi and Action fans. Eight strangers awake in freefall, parachutes opening just in time for a landing in a jungle unlike any they have ever experienced. How they got in this situation they don't know, but most of them, including Royce (Brody), the man who becomes their de facto leader, are mercenaries or insurgents of some sort. One, Cuchillo (Rodriguez regular Danny Trejo), is a drug cartel enforcer. Another, Stans (Walton Goggins, soul of TV's The Shield), is a killer two days from execution. The lone female, Isabelle (Alice Braga), a sniper, retains the most humanity. Royce is the one who realizes that all of them--save for Edwin (Topher Grace), an apparently nice guy doctor--are basically predators thrust into the unaccustomed role of prey for unseen hunters who dog their every move. Predators freely acknowledges its storied ancestor with Isabelle recounting the story of Schwarzenegger's ill-fated mission and both Alan Silvestri's original theme music and Little Richard's "Long Tall Sally" imported from Predator for the soundtrack. It also shares with its predecessor a measured approach to action, allowing the film to slow (almost to a standstill at times) to give the tension room to build. Made for a modest $40 million with visual effects overseen by Rodriguez, the alien creatures, complete with cloaking effect, are effective counterparts for their human game. Dialogue tends to be weak, the character types are overly familiar and Predators follows the blueprint laid down by the 1987 original so closely at times that it can be a little too easy to guess what will happen next, which is one of the things that makes Laurence Fishburne's cameo so welcome. Not part of the original group, he appears from out of nowhere, spouting a mixture of wisdom and gibberish. The scene plays like a weird little valentine to Apocalypse Now, with Fishburne--who co-starred in Francis Ford Coppola's Vietnam epic when he was just a teenager--cast as a kind of Col. Kurtz, the battle-scarred veteran driven bonkers by his experiences. It's a suspenseful, funny and completely lunatic sequence that gives the movie a needed lift just as the mayhem starts to feel mundane. One imagines that it would take three Adrien Brodys to make one muscle-bound Arnold Schwarzenegger, but Brody is surprisingly effective in a far more physical role than his usual. Braga, Grace and Goggins are especially good in the supporting roles. Despite the limitations built into the characters, the four actors are vivid enough to make one care who lives or dies in a movie where guessing who will meet a gruesome end next is practically a game. Predators may not be the instant classic Predator was, but as an action-oriented Sci-fi thriller and an entertaining summer diversion, it fills the bill. Rating: R for strong creature violence and gore, and pervasive language.